Does Write & Improve +Test Zone cover both the IELTS Academic and the IELTS General Training exam? 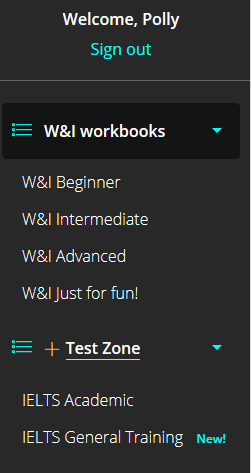 +Test Zone offers tasks for both IELTS Academic Writing, and IELTS General Training. Write & Improve IELTS Workbook provides 52 IELTS Academic Writing exam tasks for English learners wanting to prepare for the writing component of the IELTS Academic writing test. It also provides 40 IELTS General Training writing tasks for those preparing for the IELTS General Training exam. For both workbooks, the tasks are presented in pairs; one task 1 and one task 2. Subscribers need to complete and check both task 1 and task 2 to get an estimated IELTS score and feedback for both tasks. Subscribers can also create their own IELTS-style exam tasks in their own workbooks and set them to get an IELTS score. Again, both task 1 and task 2 must be completed, as in the real exam. Just click on the specific IELTS exam you are preparing for under '+ Test Zone' in the menu. There is one free test for you to try before you subscribe.